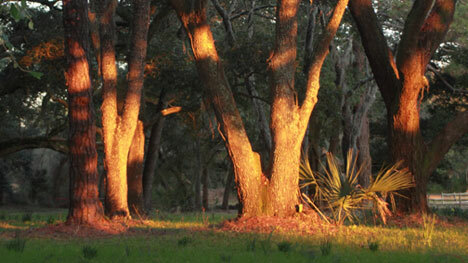 Sun-struck trees glow in the light of the setting sun. 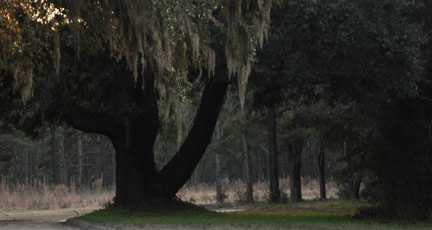 Spanish Moss decorates almost every tree. 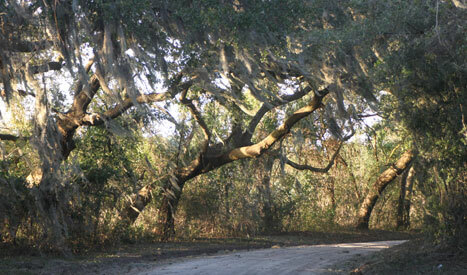 Carefully placed trees line the roadways. wooden fences contained farm horses, riding horses, cows and other livestock; here and there a sprinting chicken, farm dogs or cats. All of that now gone leaving wide open empty pastures decorated with shade trees with bottom branches manicured evenly at the height a deer can reach for tender young branch sprouts. Cabbage palmetto adds wonderful texture. Tiny birds hip-hop from branch to branch: pine warblers and yellow throated warblers, chickadees. Depending on the season one can see and hear a variety of songbirds: vireos, tanagers, of course the warblers. It is a pleasure to sit leaning on a large tree trunk quietly watching as the day meanders slowly, ever so gradually to a stop and the night rolls in like a fog. 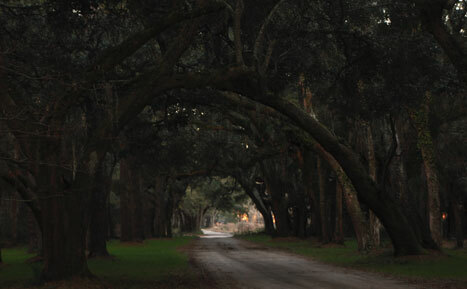 The plantation closes at sunset. At the 19th century ice house, one of the few remaining structures of that bygone age, I check my bearings, and vow to return for an afternoon hike out Indian Point trail. 19th century ice house still stands though the main house is gone. The sun is almost gone, leaving only quiet light to guide me back to the entrance gate. The rows of trees must have been purposely planted in their uniform fencelike positions along the roadway; their symmetry rendering the landscape to quiet dignity. Wheat as high as your knee still flourishes. sniffing and watching the visitor as I pass through the gate. The squirrels give way as the little night animals begin to come forth: opossum, raccoon, snipe, rabbits, feral cats’ activities just beginning. I stop for a moment to gaze back surveying the charming scene; certainly I will return another day. Watch for Part Two: Indian Point Trail Hike. Just around the bend is another vista to see. What a beautiful word picture you have painted and your photographs are so evocative of the mood of this place you have brought to us. Sounds like a really nice place. I’ll need to check it out sometime soon. Thanks for telling us about it in such a descriptive way. Really lovely post. You find beauty wherever you go. Must be that photographer’s eye of yours. the arches remind me of Kauai. Rare Beauty! Great job Bill, another great post!